Exactly a week since Expedition 36 crewmen Chris Cassidy and Luca Parmitano ventured outside the International Space Station, the two men are due to perform a second spacewalk on Tuesday, 16 July. It will be the 23rd station-based EVA from the U.S. Operating Segment (USOS) and will see Cassidy on his sixth career spacewalk. Designated “EV1,” he will sport red stripes on the legs of his suit for identification, whilst Parmitano—who made history on 9 July by becoming Italy’s first spacewalker—will wear a pure-white suit as “EV2.” The two men will prepare the station for the future arrival of Russia’s Nauka science module, relocate a Wireless Video System External Transceiver Assembly (WETA) from the P-1 truss to the Harmony node, install a set of V-guides onto the port and starboard Radiator Grapple Bars, and complete a series of ambitious get-ahead tasks. Cassidy and Parmitano’s inaugural EVA on 9 July was highly successful, and the spacewalkers concluded their duties about 30 minutes ahead of schedule. This led to some reprioritizing of their tasks for EVA-23. Notably, the removal and replacement of a failed camera at the corner of the Exposed Facility on Japan’s Kibo laboratory—originally planned as a get-ahead task—is now firmly entrenched as a main objective. Additionally, six other get-ahead items have been attached to the spacewalk. These include replacing a faulty lens cover on a Camera/Light Pan/Tilt Assembly (CLPA) on the Canadarm2 robotic arm, the tie down of brake handles on the port-side Crew and Equipment Translation Aid (CETA) cart, and the relocation of a portable articulating foot restraint from the P-1 to the S-0 truss. This forms the latest spacewalk in a “hot EVA summer” for Expedition 36, which also saw cosmonauts Fyodor Yurchikhin and Aleksandr Misurkin working outside the station’s Russian Operating Segment (ROS) on 24 June. For tomorrow’s EVA, Yurchikhin and U.S. astronaut Karen Nyberg will serve as “intravehicular” crew members, helping Cassidy and Parmitano into their suits and running the checklists inside the Quest airlock. Early Tuesday morning, after post-sleep and personal hygiene activities, the spacewalkers will jump right onto a well-trodden path of 60 minutes of “pre-breathing” on masks, during which time the airlock’s inner “equipment lock” will be depressed from its “ambient” 14.7 psi down to 10.2 psi. Their next step will be the process of donning and purging their bulky Extravehicular Mobility Units (EMUs)—with Parmitano’s suit emblazoned with the red, white, and green stripes of the Italian national flag—after which the atmosphere will be repressurized to 14.7 psi. The astronauts will then enter a nominal pre-breathing period, lasting about 50 minutes, followed by a further 50 minutes of In-Suit Light Exercise (ISLE). 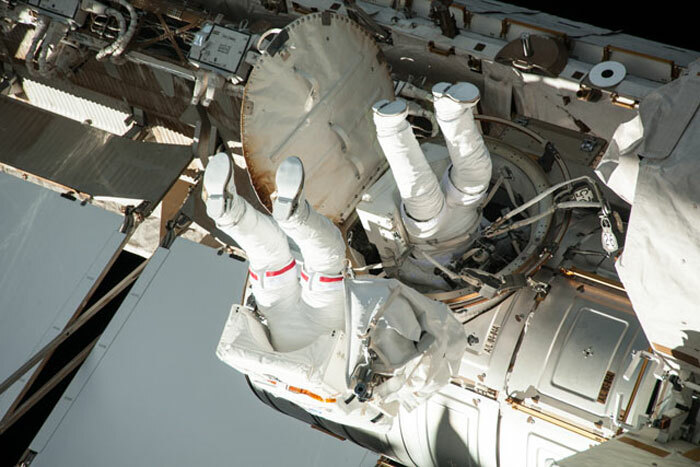 This protocol was first debuted on the STS-134 shuttle mission in May 2011 and will involve Cassidy and Parmitano flexing their knees for four minutes, resting for one minute, and repeating over and over until the 50 minutes are up. ISLE serves to remove nitrogen from the spacewalkers’ blood in a much shorter time period. An hour before the EVA’s scheduled 8:10 a.m. EDT start time, the fully-suited pair and their equipment will be transferred into Quest’s outer “crew lock,” and Nyberg and Yurchikhin will confirm the closure of hatches between the two locks. Depressurization will be briefly halted at 5 psi for standard leak checks, after which the process will resume and continue until the crew lock is at near-vacuum conditions. EVA-23 will officially commence when Cassidy and Parmitano transfer their suits’ critical life-support utilities onto internal battery power. Monitoring them from Mission Control in Houston, Texas, will be a team headed by ISS Flight Director David Korth. Fellow astronaut Shane Kimbrough will occupy the Capcom’s console throughout the EVA. Unlike last Tuesday’s spacewalk, which saw Cassidy as first outside, on EVA-23 it will be Parmitano who will be first to depart the Quest crew lock. He will configure tethers and equipment before Cassidy joins him to temporarily stow a multi-layer insulation bag for the Main Bus Switching Unit (MBSU) and retrieve a large orbital replacement unit bag, containing the V-guides that he will need later on the spacewalk. After checking each other’s suits and tethers, the men will part ways to commence their first tasks. For Cassidy, this will involve a return to a rather thorny site on the port side of the box-shaped Z-1 truss, atop the station’s Unity node. 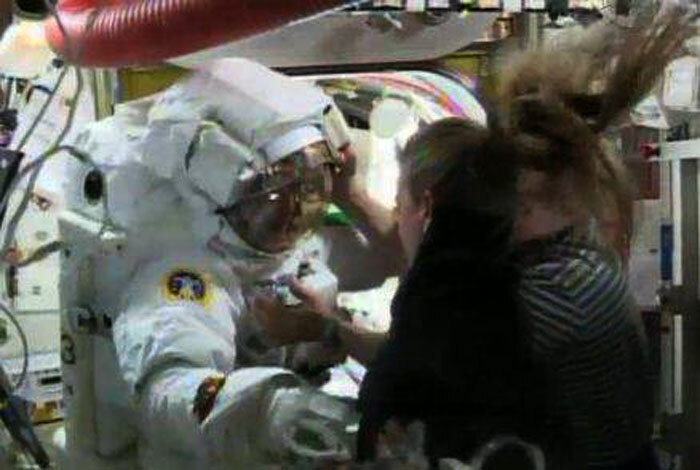 Here, he will conclude the reconfiguration of Y-Bypass jumper cables, which he began during last week’s EVA-22. Due to the sheer volume of cables, connectors, and jumpers—caused by numerous electrical and data system upgrades and changes over the years—the area has been nicknamed “The Rat’s Nest.” After Cassidy has completed the jumper installation process, which should require about 30 minutes of his time, Mission Control will route power to the DC Converter Unit connected to the system to perform a checkout. Whilst this is underway, Cassidy will reconfigure a flap of multi-layer insulation on a Remote Power Control Module close by. As Cassidy works at the Z-1 site, Parmitano will translate “under” the Unity node to its aft end cone, where he will temporarily stow a bag of data cables. He will mate the 1553 data cables, hooking up the Power and Data Grapple Fixture (PDGF) on Russia’s Zarya module to ISS data systems and checking for a misconfigured multi-layer insulation grounding wire inside one of the PDGF connector doors. Parmitano will release a short section of the data cable and route it forward onto the Pressurized Mating Adapter (PMA)-1, which forms the junction between the U.S. and Russian segments of the station. This will ultimately permit Canadarm2 to access the Russian segment. After the 1553 installation, which is expected to require about 15 minutes, he will embark on the hour-long task of retrieving and installing an Ethernet cable in support of Russia’s Nauka science module, whose launch is anticipated later this year or early in 2014. Parmitano will connect one end to a spare Ethernet connector at the junction between the Destiny, Unity, and Tranquility modules, then lay out the cable as he works his way aft toward the Russian segment. This will eventually allow Canadarm2 to access the Russian segment of the station. He will utilize EVA handrails and wire ties to restrain the cable. When he reaches the forward end of Zarya, he will tie off the cable onto a handrail, from which Russian spacewalkers will pick up the work later this year. Whilst Parmitano cleans up the worksite, Mission Control will conduct a short communications check, after which the astronaut will collect his equipment and return to stow it in the Quest airlock. After completing his own work on the Y-Bypass jumper cables, Cassidy will translate to the P-1 segment on the port side of the space station’s expansive truss structure to begin the installation of four radiator V-guides onto the Radiator Grapple Bars (RGBs). These bars—which arrived at the ISS aboard SpaceX’s CRS-2 Dragon cargo ship in March 2013—were installed on the P-1 and S-1 trusses during last week’s EVA. When Cassidy reaches the P-1 worksite, he will bolt the V-guides onto stowage brackets attached to the RGB, using his pistol-grip tool to secure them, before repeating the process on the RGB on the S-1 truss. The lengthy task should require about 90 minutes. Parmitano will then move from his cable work to the S-0 central truss segment, where the starboard Secondary Power Distribution Assembly (SPDA) door is located. Two weeks ago, on 27 June, efforts to use Canadarm2 and the Dextre robot to open the port-side door were unsuccessful when a PIP pin lanyard caused an obstruction. Parmitano will assess the situation and, if practicable, he will use scissors to cut the lanyard and free the door. He will then repeat the procedure for the starboard SPDA door. By this stage, about two and a half hours should have elapsed on EVA-23 and the spacewalkers’ next task will be a joint one. 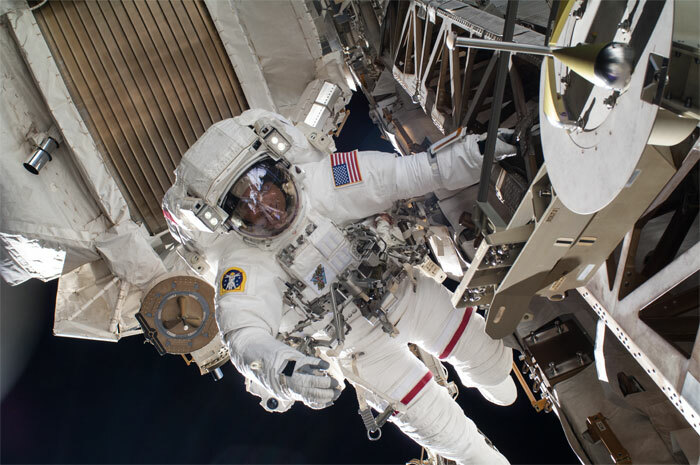 They are scheduled to remove and relocate the Wireless Video System External Transceiver Assembly (WETA) antenna, one of whose roles is to provide helmet video views. The astronauts will demate three connectors from the P-1 truss and release a single bolt which holds the 7-foot-long WETA antenna stanchion in place. They will position the WETA and its stanchion onto Cassidy’s body restraint tether, retrieve their tools, and move to the aft end cone of the Harmony node. Due to the large size of the WETA, Parmitano will pay close attention as Cassidy moves, in order to ensure that he does not bump anything on the way. At Harmony, the men will return the WETA to a vertical position and drive the bolt to secure it in place. Four hours into the spacewalk, the astronauts will go their separate ways again. Cassidy will head to Japan’s Kibo laboratory on the far-port side of the station to replace a camera on the forward corner of the porch-like Exposed Facility. Incidentally, Cassidy installed this camera—part of the EF Visual Equipment—on his first space mission, back in July 2009, and consequently he is familiar with the area. He will install a “scoop” onto the camera, before removing two bolts, unlatching the camera, and demating one connector. Cassidy will then install a replacement camera, whereupon Mission Control will activate its heater and begin the process of testing after the EVA has ended. Parmitano’s next task will also be a return to a familiar place: the ExPRESS Logistics Carrier (ELC)-2, from where he retrieved two materials science experiments last week. This time, his role is to remove a large blanket of multi-layer insulation from the failed Main Bus Switching Unit (MBSU)-1. This was removed—though not without difficulty—during a pair of EVAs by Expedition 32 crewmembers Sunita Williams and Aki Hoshide last summer and presently resides on ELC-2. By removing the insulation blanket and using wire ties to restrain flaps, Parmitano will ensure that they do not interfere with robotic interfaces with MBSU-1. This will enable the failed unit to be removed robotically in the future. With the exception of get-ahead tasks, these activities will conclude what is expected to be the final U.S. EVA of 2013. Cassidy and Parmitano are expected to remain outside for about 6.5 hours. 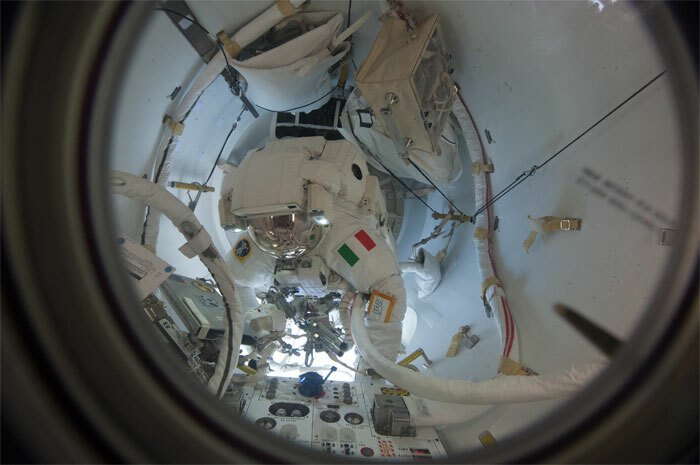 A little more than one hour into Tuesday's spacewalk, Luca Parmitano of the European Space Agency reported water floating behind his head inside his helmet. The water was not an immediate health hazard for Parmitano, but Mission Control decided to end the spacewalk early. Flight Director David Korth directed that both Chris Cassidy and Parmitano return to the Quest airlock and re-enter the station. Cassidy took care of clean-up procedures before returning to the airlock. The spacewalk officially began at 7:57 a.m. EDT, and ended at 9:39 a.m. when the airlock was repressurized, for a total duration of 1 hour, 32 minutes. Cassidy and Parmitano had planned to complete a number of tasks to prepare for the arrival of a new Russian Multipurpose Laboratory Module later this year, replace a video camera on the Japanese Exposed Facility experiment platform, relocate wireless television camera equipment, troubleshoot a balky door cover over electronic relay boxes on the station’s truss and reconfigure a thermal insulation over a failed electronics box that was removed from the station’s truss last year. Mission managers will work to identify when the unfinished tasks will be completed. None of those tasks are urgent, and the crew and station are not in any danger. An ISS Expedition 36 Post-Spacewalk briefing took place around 4:30 p.m. on NASA TV. Participants were Korth, lead spacewalk officer Karina Eversley and Kenneth Todd, ISS Mission Management Team Chairman. This spacewalk was the second shortest in space station history. It was the 171st spacewalk in support of station assembly and maintenance, totaling 1,075 hours, 22 minutes. Cassidy now holds 31 hours and 14 minutes during six spacewalks, and Parmitano now holds 7 hours and 39 minutes during two spacewalks. CAPE CANAVERAL – A serious water leak inside a spacewalker’s helmet forced NASA to cut short an excursion outside the International Space Station. 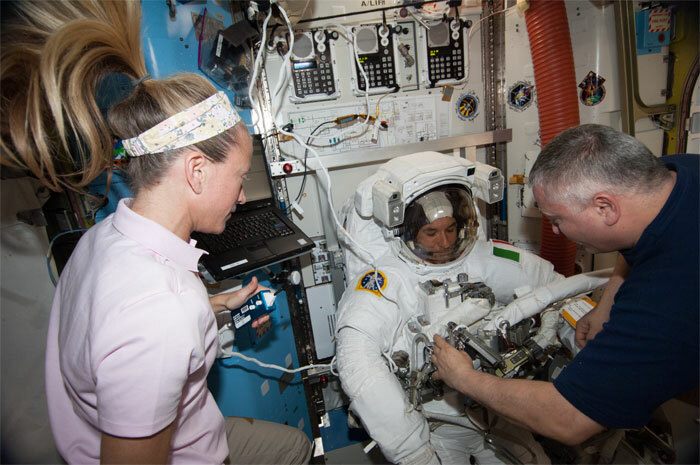 European Space Agency astronaut Luca Parmitano, who last week became the first Italian to walk in space, reported a build up of water inside his helmet about an hour into an excursion with U.S. astronaut Chris Cassidy. The water initially pooled in the back of Parmitano’s helmet, behind his head. But ultimately the water – which apparently came from Parmitano’s drinking water bag -- floated into his eyes, and flight directors on Mission Control quickly called an end to the outing. Parmitano was told to head back into the U.S. Quest airlock, and Cassidy followed. Once inside, it appeared the water leak caused the communication system in Parmitano’s suit to fail. He apparently could not hear questions about his condition. U.S. astronaut Karen Nyberg and two Russian cosmonauts – Pavel Vinogradov and Fyodor Yutchikhin, scrambled to remove Parmitano’s helmet once he was back inside the station. They used towel to soak up water blobs that floated from the helmet. Mission Control asked Nyberg to take photographs of Parmitano’s spacesuit, particularly anything that might seem amiss. And she was asked to make certain they documented the condition of the suspect water bag. The planned six-hour, 15-minute spacewalk came to an end one hour and 32 minutes after it started. The two astronauts were able to get some maintenance work done outside the station. But not nearly the amount of work they had set out to do. The excursion was the second in seven days for the astronauts. Cassidy and Parmitano ventured outside the station July 9 and performed myriad maintenance tasks. They also retrieved two science research experiments. Today, the astronauts had planned a variety of maintenance and assembly-related tasks. Among them: laying electrical power and Ethernet cabling to the juncture between the U.S. and Russian sides of the outpost. The cabling ultimately will be extended to a Russian multipurpose module that will be launched late this year from Baikonur Cosmodrome in Kazakhstan. The Nauka, or “Science,” module will triple as a laboratory, a docking compartment and an airlock. It will replace the Russian Pirs, or “pier” module, which was launched to the station in August 2001. ++ Replace a video camera on the Japanese Kibo research facility. ++ Relocate wireless television camera equipment. ++ Set up equipment that would be used in the event a 40-foot radiator failed and had to be removed and replaced. The spacewalk was the 171st to be performed in the assembly and maintenance of the station, the construction of which began in late 1998. The shortest spacewalk in ISS history: 14 minutes. On June 24, 2004, Russian cosmonaut Gennady Padalka and U.S. astronaut Mike Fincke ventured outside the outpost. However, their outing was called off when a pressure problem was detected in the oxygen tank within Fincke’s suite. 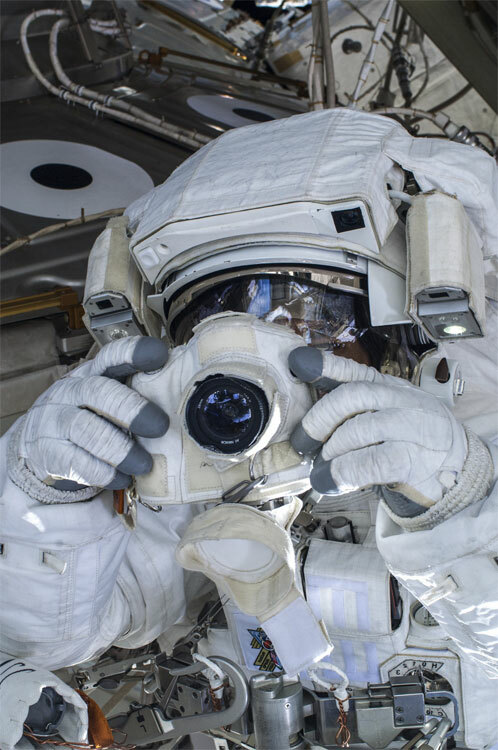 ESA astronaut Luca Parmitano uses a digital still camera during a spacewalk as work continues on the International Space Station. A little more than one hour into the sortie on 16 July, Luca reported water floating inside his helmet. The water was not an immediate health hazard for Luca, but NASA Mission Control decided to end the spacewalk early. Both astronauts are well, and the cause of the leak is still being investigated.